Doug Pederson (right) and Carson Wentz are the type of combination that can set the Eagles apart in today's NFL. Carson Wentz wants to be heard when the Eagles are installing new plays in their offense or when they are devising a game plan. Most quarterbacks would. And most coaches would be wise to listen. What would be the point in calling a play the quarterback didn’t like to run? But there are times when the greater good of the offense takes precedence over one player’s comfort, even if that player is the most important one on the field. Wentz understands the dynamic, and that coach Doug Pederson wields final say. But that hasn’t stopped him from having what he calls “healthy dialogue” with his coaches during the week of preparation. 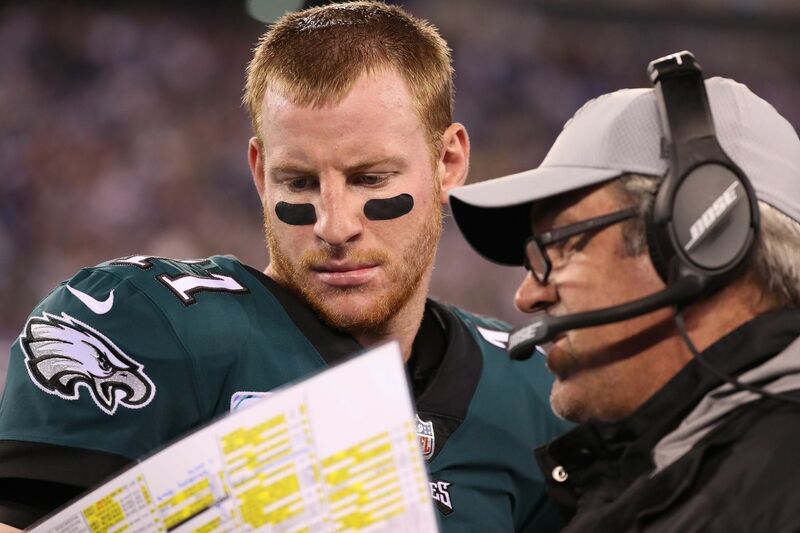 A season ago, then-offensive coordinator Frank Reich said that Wentz used to get into arguments with his college offensive coordinator, but that the Eagles considered it a positive because it revealed a certain amount of confidence. Wentz would have similar discourse with Reich, and likewise his strong personality was viewed favorably because of the team’s success. But the same character trait was described in negative terms in a recent published story that labeled Wentz “selfish” and “uncompromising,” and it said that he “bullied” new offensive coordinator Mike Groh as the Eagles struggled last season. “I know Frank has gone and said that he and I used to have these competitive arguments, but they’re healthy,” Wentz said recently during a sit-down interview. “That stuff happens. That’s, I think, what good football teams have, the ability to respectfully do that and kind of be stubborn and those things. Wentz admitted that he could be guilty of being selfish, but he denied the bullying part and said that he spoke to Groh the day the story came out. He also countered the claim that he refused to run Nick “Foles stuff,” the implication from the story being that Wentz would overcomplicate the offense. “We both see the game differently to some extent,” Wentz said. “But to say I was resistant to running his stuff and then vice versa, there’s so many things to the X’s and O’s of the game, to just say a blanket statement like that just doesn’t necessarily do it justice. There are essentially three levels when it comes to implementing an offense. There is, of course, the playbook. There is the game plan that takes a select group of plays from the playbook. And there is the in-game play-calling, which is selected from the game plan. The Eagles’ offensive playbook is a living organism. Pederson’s system is already much different from the one he initially installed just three years ago. Like any good coach, he has gathered ideas from his assistants, and in some instances, from his quarterbacks. During the week of preparation, each assistant is given an area of focus. Groh, for instance, handled third down. Quarterbacks coach Press Taylor was responsible for the red zone. And offensive line coach Jeff Stoutland oversaw the run game. They study film of the opponent and by Tuesday have a set of plays. Wentz will do his own analysis and suggest plays he would either like to have installed or included in the game plan. “There’s plenty of times throughout the week where, like each coach is responsible for certain parts of the game plan, and then I’ll watch film and I’ll bring a play,” Wentz said. “So it’s third down, I’ll bring it to the coach who works on the third-down stuff. I’ll bring up a play and then I’ll try to get it installed. Before he was traded, Sam Bradford suggested the Eagles run a “mesh concept” play he had learned from Chip Kelly. Pederson had a similar play, but he decided the Kelly design was better, and the Eagles have since had great success with it. Foles completed 4 of 4 passes in the Super Bowl on the play, including a fourth-down toss to tight end Zach Ertz on the Eagles’ game-winning drive. Last season, Pederson dialed it up again on a crunch-time fourth down, and Wentz hit receiver Nelson Agholor on the way to the Eagles’ comeback win over the New York Giants. Wentz’s most lasting contribution to the playbook has been a red zone play he brought from North Dakota State. The Eagles installed it early in the 2017 season and named it “Mario,” and Wentz would toss several touchdown passes on the play. But so, too, had Foles – most notably on a touchdown pass to receiver Alshon Jeffery in last year’s NFC championship game, and just last month to tight end Dallas Goedert in the Eagles’ first-round win over the Bears. Wentz and Foles have said they like the “mesh concept” and “Mario” plays because there are answers against both man and zone defenses. But as Wentz noted, the quarterbacks have different preferences. Wentz often wants as much pre-snap information of a defense as he can get, which often involves using various motions and shifts as indicators. After the Eagles beat the Rams in December with Foles, Pederson said that cutting down on pre-snap motions benefited the offense. “From a play-call standpoint, just a tempo [standpoint], just to try to get up and get lined up and eliminate some of those things where maybe it wasn’t all together necessary,” Groh said then. Pederson and Groh said they had made the decision before the Eagles discovered that Wentz had a stress fracture in his back, but a similar change was made the year before when Foles took over. Foles didn’t care as much about having input in game-planning. He also had a longer history with Pederson, dating back to his rookie season, and thus may have been more comfortable entrusting his onetime quarterbacks coach with devising a strategy that would suit his needs. We have seen Foles advocate for plays in-game, to great effect in the Super Bowl with Philly Special, and to a lesser extent in the victory over the Bears with a sprint-out touchdown pass to receiver Golden Tate. Pederson likely has a similar philosophy. But he must balance his team’s best interest with that of his quarterback. The same could be said of Wentz. The answer, like the assessments of his type-A personality, is subjective.